Human Foosball is like the classic table top Foosball, however, it is played with real people, a soccer ball and in a large enclosed arena. Two teams compete against each other to score the most goals in the allotted time. 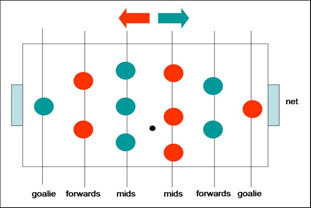 Each team consists of 6 players in 3 different rows that must face the opposing teams goal at all times: 1 goalie, 3 mid-fielders and 2 forwards. Teams are allowed up to four (4) spare players, who may only substitute at the intermission during any game. 6 poles are laid cross the arena with a sleeve over each. The sleeve allows the players in each row to move laterally along the pole, but not forward or backward. The game is played in two 10 minute halves, with a 5 minute half-time between each. Teams change sides after half-time. All Team Players must sign a waiver before they are able to play. Players will be positioned at the appropriate places in the arena. Players must keep both hands on their respective handles at all times, and one foot must be touching the ground. Shoulders must be kept above the bar at all times. The game starts by the ref rolling the ball into play from the mid-field area. Play continues until a penalty occurs, a goal is scored, or the timer runs out. Players can only move laterally from side to side. Mid-Fielders and Forwards must work together to move side to side. Teamwork is key. Player substitution is allowed at halftime. Any player or goalie takes their hand off of their handles. The foosball hits or goes over the other side of one of the poles or an object above the pole. A goal will be awarded to the shooting team, if the opposing team deliberately takes their hands off the bar to prevent a shot on net. When a goal is scored, the game is restarted by giving possession of the ball to the scored on team in the mid-field area. When the ball goes out of bounds (sides or ends), the game is restarted by giving possession of the ball to the non-offending team in the mid-field area. The game is over when the time expires. The game officials will provide the final score. All team members must sign waiver before being eligible to play. Teams are responsible to ensure they are at their correct location and ready to compete at the scheduled beginning of the round. The organizers reserve the right to disqualify any team who is not ready to play. This rule is imposed to not to delay the programming for the event. Absolutely no hanging off of the poles, one foot must be on the ground at all times, and shoulders not allowed below the bar. Protective cups are recommended. Protective soccer shin pads and face protection may also be worn by players. Proper footwear is mandatory. Footwear must cover the entire foot and hard covered (steel toes) footwear will not be allowed. A random draw will determine the order in which the games are scheduled and the order of team seeding. The organizers reserve the right to add or delete rules prior to the start of the championship. Please check this website prior to starting play. The organizers reserve the right to prohibit any player or team from participating if they are deemed to cause safety concerns. The organizers reserve the right to reject any entry. All matters not dealt with in these rules should be referred to the organizers, whose decision on such matters shall be binding.